I found this line of refrigerators from an Italian appliance manufacturer called Ardo. Ardo's website is in Italian and it's worth picking through. If you're on their home page, hit the tab "Prodotti" (Products). Once on the Prodotti page, hit "freddo," and you'll be directed to their refrigerators. Freddo means cold by the way. Now, if you're not in Europe, you're not going to find an Ardo. Even if you do find one, it won't work on American current. So why am I telling people to check out their site? It's simple really. Companies like Ardo are on the cutting edge of where the appliance world is headed. Ardo's fun new refrigerators are interesting because Ardo doesn't treat a refrigerator as a necessary evil. Ardo spend a lot of time and energy designing them and making them interesting. That impulse falls in line with the American kitchen design trend to make the kitchen the center of the home. Ardo may end up coming into the American market in the same way that a lot of other European brands have over the last 20 years. And even if they don't, the impact of the refrigerators pictured above will be. Ardo's nearly furniture-like refrigerators are in perfect keeping with the idea of a kitchen as a furnished room used for entertaining as much as for food preparation. So remember that name kids. 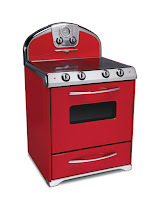 Elmira Stove Works is an Canadian company that makes retro appliances. Until recently, their products have concentrated on wrapping modern cooking technology in an appliance that would have looked at home on the prairie in about 1860. In fact, Elmira still makes wood-burning cook stoves for the purists out there. But new from them is a line they're calling Northstar. Northstar ranges and refrigerators are an exaggerated return to the middle of the last century. I mean, look at these things. They make me laugh sure enough, but I'm not sure sure I want that kind of a laugh every morning. But Florida being Florida, there is a lot of mid-'50s architecture here. An increasingly popular thing to do with a vintage '50s Florida ranch house is to take it back to the period when it was built. Finding Eisenhower-era furniture and lighting isn't so tough. Linoleum is making its old vintage patterns again to fulfill that niche. When it comes to appliances however, you're left with trying to breathe life into actual vintage appliances or abandoning the idea of a period kitchen. Enter Northstar. Trying to make a go of it with 50-year-old kitchen appliances may sound like a good idea, but even when they were new they didn't work as efficiently as modern ones do. I remember what a pain non-self-defrosting freezers were and thanks but no thanks. Northstar's stuff is different though. They are modern, efficient appliances wearing retro clothing. Though they are not cheap, their prices don't cross the line into outrage either. Now if you notice the color of the gas range I'm showing a couple of inches above. I would call that Avocado Green. It's the first use of Avocado Green I've seen on a new appliance since Avocado joined hands with Sunset Gold and disappeared some time in the late seventies. I am no psychic, but the smart money's on a resurrection of those old colors. So Ardo and Northstar speak to a larger trend of attention-grabbing appliances. Expect that to be a trend that will continue well into the future. Enough with the bottled water already! What's modern and what's contemporary? Is there such a thing as a sustainable counter? Listen while I opine some more about counters.